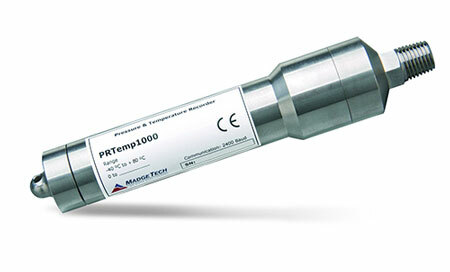 The PRTemp1000 is a rugged pressure recorder to accurately monitor and record pressure and temperature at user programmable reading intervals. The rugged stainless steel design allows for the device to be placed in harsh environments, which makes it well suited for use with air conditioning systems, chilled water, hot water, air, gas, oil and steam pressure systems. The internal temperature sensor provides accurate temperature measurements without the need for a separate temperature recorder. The logger can be started to take measurements as often as every two seconds, up to one reading every twelve hours. It will store up to 16,383 readings in its non-volatile memory. Data Loggers require a software support kit which includes USB cable, software and manual.